Browse through hundreds of Aboriginal made didgeridoos, all with individual pictures and MP3 sound files. 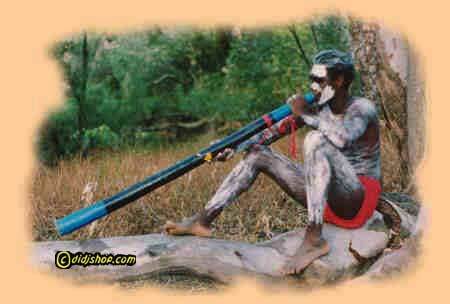 Send your friends a didgeridoo sound greeting card!!! 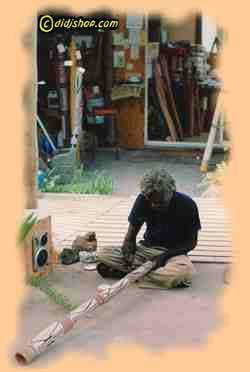 The didjeridoo is the unique and ancient instrument of the Australian aborigine. Through its haunting, yet powerful, sounds, the didjeridu evokes reverence and oneness with nature. The deep drone of the didjeridoo allows us to relax and to reconnect with mother earth. The spiritual and healing power of the didj has been used for thousands of years in secret ceremonies of Australian aborigines. Hear the unique sounds of individual didgeridoos in streaming MP3 - before you buy! Welcome to the first virtual didgeridoo shop where you can view individual didjeridoos for sale as well as listen to the sound of individual didges. In our didgeridoo shop, what you see and hear is what you get. No flashy picture to look at and then an expensive 'Didgeridon't' in the corner of your living-room ever after. We sell reliable high quality, genuine Aboriginal artefacts and have a growing business after nine years, without any advertising. All our didjeridus and other artefacts are produced and painted by Aboriginal people. As well as displaying the largest range of didgeridoos for sale online, this website provides substantial background information about didgeridoos, Aboriginal culture and other related topics. A good starting point is the Information page. We plan to keep extending the site to cover more and more didgeridoo-related topics. Your comments, inspirations and questions are welcome - please email the Didjshop Webmaster. For wholesale inquiries regarding The Didjshop's didgeridoos and other Aboriginal artefacts please email us. For queries or questions concerning any of our departments please Click Here to select the appropriate response form. All information on this site including text, sound files, photos etc is under copyright by Didjshop.com. You may use any information for your personal information - and supply any of this information to any third party providing you also supply this copyright note and the source of the information. In the case of sound files you shall also provide the name of the artist (unless otherwise stated, Trevor Peckam). No information on this site may be used for commercial purposes without prior written permission of Didjshop.com. For permission please email us. Is this your first visit to The Didjshop? If so, we suggest you start HERE. Our main information page provides links to other material about digeridoos and related topics. 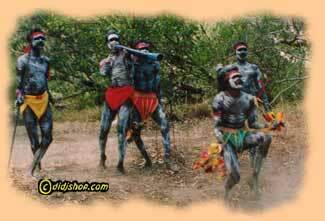 Aboriginal Culture - a brief introduction to the culture of Australian Aborigines - the most ancient continuous culture on earth. Boomerangs - The Didjshop has a selection of authentic Aboriginal boomerangs for sale, including burned, hook, painted, club and killer boomerang. Artists - meet some of the Aboriginal artists who supply us with didgeridus and create the other Australian indigenous artefacts we sell such as bullroarers, boomerangs and clapstick sets. Learn to play the didgeridoo - a one-hour 'learn to play the didgeridoo' tutorial video giving extensive instructions on circular breathing and lots of other useful information of value to beginners and advanced players. Soundscapes - hear two didgeridoo players play a range of our didgeridoos - from high concert class didgeridoos to second class didjes. These players are of different skill levels. Listen - in downloadable MP3 - and compare results achieved with a range of didgeridoos by these two players. FAQ's - Frequently Asked Questions about didgeridoos: how to play the digeridoo, circular breathing, didjeridoo maintenance & repair, what makes didjs sound different etc. Visitors Book - see what Didjshop visitors and customers have to say about our website and customer service. You can add you own comments - and maybe a photo of you and your didgeridoo? 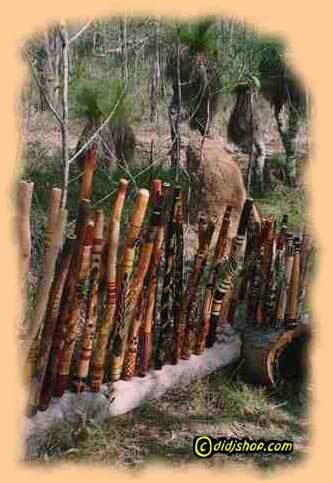 Didgeridoo World - a new gateway to the growing global community of didjeridoo enthusiasts. We need your help to add new information and keep this resource useful and up-to-date. Send a FREE Didjshop Greeting Card! WIN a superb concert class traveller's didjeridu... and be in the running as well to WIN a $50 Didjshop Gift Voucher - we give one away every month! Like to see these choices - and more - all in one list? Check out our Sitemap. Join the Didjshop's Monthly Newsletter Email List! You can see our latest newsletter online. hear no didjeridou - see no didjeridoo - buy no digeridoo! listen to digeridoo - view a dijeridoo - score your didgeridu! didjeridoos, dijeridoos, didjes, didges, yidaki or jidaki - make didjshop.com your one-stop didj shop!